Even though the townies and tourists that occupy Mystic’s small seaside Connecticut community understand that Leona will never reveal just what it is that she imports from overseas to season her pizzas to perfection, the one thing they do know for certain is that the secret is in the sauce. Just like a cook can spice up a recipe as familiar as pizza by introducing precisely the right blend of uniquely unexpected, fresh ingredients, the same approach can be equally effective for filmmakers working within the often formulaic comfort food genre of “coming-of-age” movies. And admittedly like a basic recipe, there’s nothing particularly novel about Mystic Pizza ’s storyline which fuses together popular coming-of-age subgenres and favored ‘80s themes such as small town fever and big city dreams, fear of turning into one’s parents and the John Hughes style battle of the classes in the form of a Pretty in the Pink boy we’re not sure we should trust. Yet just like the one mysterious ingredient Leona uses to make her pizza’s sauce as memorable as it is mystic, what sets filmmaker Donald Petrie’s directorial debut apart is his commitment and belief in the unknown. 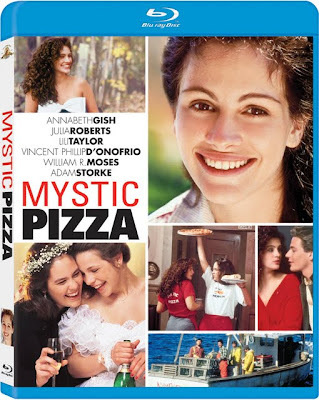 Given the 1988 release, the secret of Mystic’s success was in the sauce indeed as it’s filled with a veritable cast of (at the time) unknown stars including Julia Roberts, Lili Taylor, Annabeth Gish and Vincent D’Onofrio whose authentic, uninhibited, and naturally compelling performances onscreen are so convincing that we’re more than willing to look past the film’s minor flaws. While rather than nominated actress Roberts, it was ultimately Petrie who received an Independent Spirit Award for the movie as the Best First Feature (beating Allison Anders who later tackled similar material in her superlative second film, Gas Food Lodging ), just like Roger Ebert predicted in his opening day review, Mystic Pizza is best remembered as the film that showcased the actors before they became stars. In addition to showcasing the same tough yet vulnerable style of performance that made Julia Roberts a superstar years later in Pretty Woman, intriguingly Pizza also helped inspire the cool camaraderie Roberts had with her Ocean’s Trilogy co-star Matt Damon given the fact that he appeared across the table from her in a small but pivotal scene (in a role for which Damon’s friend Ben Affleck also auditioned). Although much like Roberts, Petrie wound up leaving the indie film world to direct the Hollywood blockbusters Grumpy Old Men and How to Lose a Guy in 10 Days, the movie established Taylor and D’Onofrio as major talents in character driven small films and their chemistry together in this early collaboration is one of the most appealing ingredients in the entire Mystic Pizza . Still, it’s Annabeth Gish, the distant relative of silent film legends Lillian and Dorothy who most captures our hearts as the heart of the film and the one in retrospect we wish would’ve paved the way for greater roles in a largely modest career. But despite falling prey to one particularly unfortunate narrative cliché that results in a girl power stumbling block, the quartet of screenwriters working from Amy Holden Jones’s premise rise above the temptation to phone it in with one-dimensional “chick flick” male and female character stereotypes. By playing against expectations in coming up with refreshing new solutions to genre old problems with surprising role-reversal approaches and character inspired plot twists, the writers craft a gently feminist, charming tale of three young women facing the prospect of starting college (Gish’s Kat), marrying her sweetheart (Taylor’s JoJo) or trying to find the right man (Roberts’s Daisy) while on the brink of adulthood. While it would’ve been wonderful to have -- if not an onscreen reunion -- than at least a compilation of interviews for the actors to reflect on what is perhaps their most auspicious early work that helped launch them into the mainstream, unfortunately Mystic lacks any worthwhile bonus features for its high-definition Mother’s Day timed debut release. However, aside from the hurdle of an unbalanced audio track that overwhelms with the external effects and music while keeping the dialogue at a perpetually low level, the visual presentation is quite impressive as we realize that fresh out of MGM/ Fox’s Blu-ray oven, Mystic Pizza has never looked better than it does now in this crisp HD transfer.